Nine Boozy Desserts in Raleigh, N.C.
Have your booze and eat it too! Indulge in these boozy treats in Raleigh, N.C., because there&apos;s always room for dessert. Twisted Fork is locally owned and operated by Rocky Top Hospitality and has been serving up delicious dishes in Raleigh for more than 13 years. Their famous Tia Maria cake is the star of the menu and is popular with diners. It&apos;s a perfect combination of chocolate chip cookies, coffee liqueur and mocha buttercream icing. The Oak offers an ever-changing menu of bourbon desserts. From bourbon bread pudding served with a vanilla bean whip to homemade bourbon ice cream, their desserts are always in high demand. Plus, The Oak has more than 60 different bourbons to try, featuring their in-house re-aged bourbon. After-dinner drinks and dessert, anyone? Add more sweetness to your pint of Guinness at the Hibernian. This Raleigh staple is serving up one decadent chocolate mousse made with your favorite Irish beer, Guinness. Their chocolate mousse is super rich and served with fresh whipped cream along with a chocolate sauce drizzle. Go ahead, order a Guinness along with that mousse. A dessert as awesome as its play on words would have to be Bittersweet&apos;s Clèm Brûlée. This clementine crème brûlée features brandy-vanilla poached clementines, sugared rosemary and pomegranate seeds. An added bonus is that it&apos;s gluten free! For just four bucks more, turn your milkshake into something boozy. Simply ask your server at Chuck&apos;s to spike your milkshake. The Dark Chocolate Cake shake with Old Grand-Dad bourbon is a winner. Want it a little stronger? Make that shot a double. Who knew this American classic could get any better? Driftwood Southern Kitchen&apos;s apple cobbler is topped with a generous helping of bourbon burnt sugar ice cream. Beer lovers, unite! Rye has the perfect treat for you. Lonerider Brewing Company&apos;s Sweet Josie Brown Ale is served over homemade vanilla ice cream to create a tasty beer float. 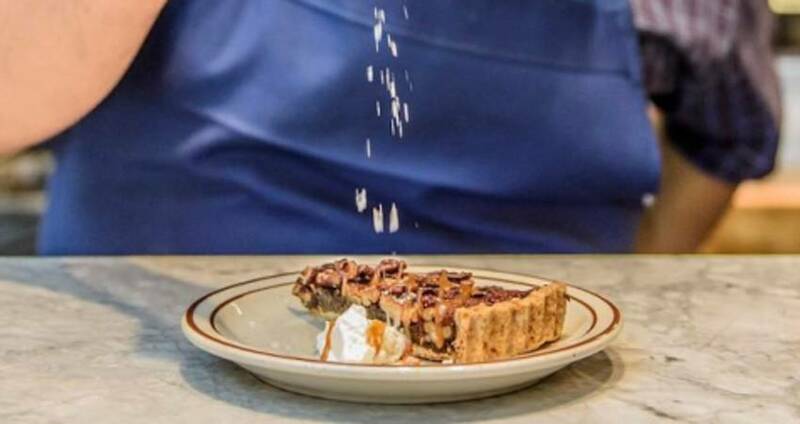 At Whiskey Kitchen, in the heart of downtown Raleigh, the shoo-fly pie is not to be missed. Pecans, molasses and bourbon caramel are tastefully combined on a flaky pastry crust and pairs perfectly with an Old Fashioned. Consider yourself a chocolate lover? Indulge in a bourbon chocolate brownie at Cameron Bar & Grill. Topped with cinnamon and brown sugar ice cream as well chocolate ganache, this dessert is sure to please any dessert lover.